Sony’s latest projector is ultraportable at 8 x 15 cm, lite and yet powerful. 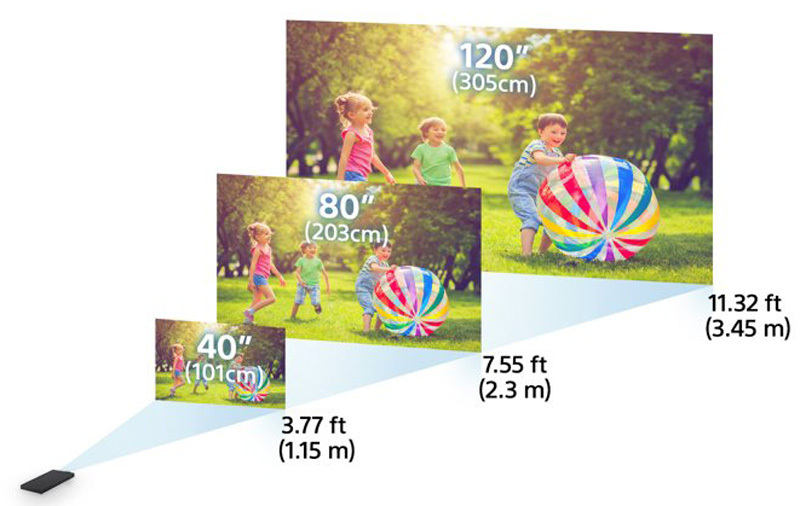 The new Sony MP-CD1 sports a maximum projection of 120 inches diagonally at a distance of 3.45 metres. Sony NZ currently only sells one mobile projector, which is the 720p MP-CL1A model. The new Sony MP-CD1 projector, therefore, timely expands the company’s projector line-up as smartphones become increasingly powerful. The projected image has a resolution of 854 x 480 px and a 400:1 contrast ratio. The full colours reach 16,770,000 colours. The projector lamp employs Texas Instruments’ DLP IntelliBright technology to boost brightness to 105 ansi lumens. This brightness level probably isn’t enough for a home theatre, but suffices out in the bach or in a tent. Sony MP-CD1 weighs 280 gram and operates with almost non-existent noise. The device’s battery lasts about 2 hours in use and has a capacity of 5,000 mAh. The projector supports charging via USB-C. Thus, it’s easy to recharge it while in use with a power bank. There’s also an HDMI cable, which means that it can be connected to a computer or a gaming console. The MP-CD1 projector will go on sale in April in New Zealand at a recommended retail price (RRP) of $715 inclusive of GST.